Try something new from the ocean with this great fish dish. 2 tilapia fillets (1/2 lb) â Or any filleted fish of your choice. Preheat the oven to 425. Mix first 5 ingredients in pie plate. Beat egg dressing and mustard with fork in separate pie plate until well blended. Place flour on plate. 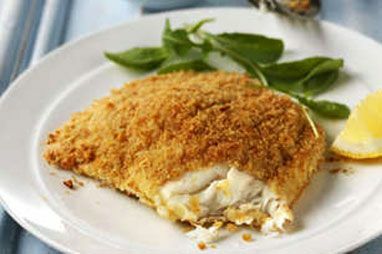 Dip fish in flour, then in egg mixture, then crumb mixture, turning to evenly coat both sides of each fillet. Place on foil-covered baking sheet. Bake 15 minutes or until fish flakes easily with fork. Tip â Use crix crackers if you donât have any buttery crackers.